From time to time the Club is asked to assist in the placement of older Gordons. These may have been surrendered by the previous owners for a number of different reasons or may have been found and not claimed by the owner. If you are interested in giving an older Gordon a home then this may be for you. To register your interest in offering a home to a rescue please contact the co-ordinator by email gscsecretary@hotmail.com or phone (02)9449 6245. 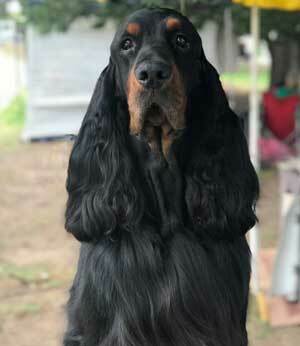 What's available . . . .
Congratulations to Sup Ch Triseter Celtic Seal (pictured) on winning the Gordon Setter Showdog of the Year competition for 2018. It is the third time Seal has won the award. Seal was bred and is owned by Triseter Kennels in Victoria. The Club will be holding two championship shows on Good Friday (19/4/19) at Ludenham Road, Orchard Hills (just off the M4). For those wanting to enter the Club shows please go to www.ozentries.com. If you are interested in learning more about the breed or just want to watch and see Gordons at all ages, please come along. Judging starts at 9.30 and continues into the afternoon. All are welcome. And on Easter Sunday Gordons will be judged at Sydney Royal.